Ah yes, how the powerful and addictive perfume of political correctness can convince otherwise intelligent folk to support causes antithetical to our well being and praise peoples who would just as soon see us dead. 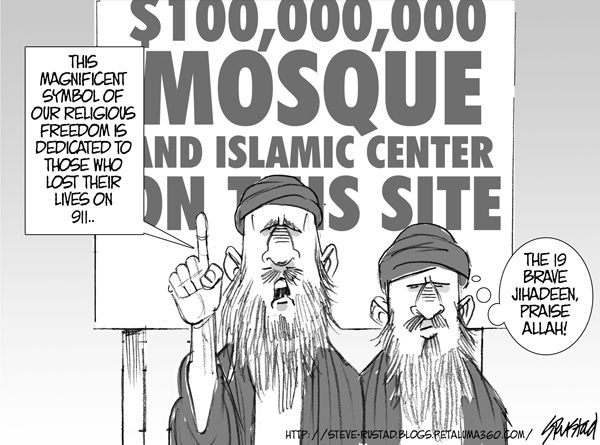 To wit, the politicians who defame and demean those who oppose the proposed mosque two blocks from Ground Zero. America was founded to provide religious tolerance, but I strongly suspect that the Founding Fathers had no intention of welcoming creeds that preach, “Death to the Infidel,” especially when the “infidel” is us.